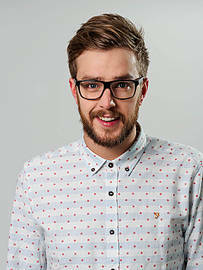 Iain Stirling is a stand-up comedian and BAFTA nominated presenter. As a stand-up, Iain performs at some of the most established comedy venues in the country. He has supported both Russell Kane and Rhod Gilbert on tour and was nominated for a Chortle Award for Best Newcomer. He appeared in the stand-up spot on Russell Howard’s Good News (BBC3) and was seen on the last series of Sweat the Small Stuff (BBC3). When can I see Iain Stirling?